I wonder how old the little boy is now? Let’s see. It’s been seven years since we started Pumpkinfest for God, which would mean…(counting the years on my fingers)…which would mean, yikes, it can’t be. He must be in high school now. The years have gone by but much to my surprise and joy there in the yard of a once little boy was a huge selection of pumpkins, organized neatly by size, sitting in various corners of the yard. I have come to look forward to seeing this festive fall display on the winding country road that led one out of New York state and into Vermont and vice versa. The sight of all these homegrown pumpkins by one little boy was for me the official kick off to fall. I felt the same childlike excitement as I felt with Santa’s arrival at the end of the Macy’s Thanksgiving Day parade, which when I was a child ushered in the official start of Christmas. We all know nowadays Christmas comes way before the fall pumpkins. Don’t even get me going with whatever happened to Thanksgiving. Pumpkins shine forth an inspirational message on All Hallows Eve as a little rural church’s witnesses to the hundreds of trick or treaters. Should I stop? I really don’t need any pumpkins for I was no longer the pastor of the little white church in which hosted Pumpkinfest for God. Ah…Pumpkinfest for God. That was one of the many ideas that came to me on my habitual morning run on the treadmill at the gym. It was early on my ministry and the little rural village had the tradition of welcoming hundreds of trick-or-treaters. From the ghoulish to the cutest, children of all ages from surrounding villages came to Salem (not Massachusetts, but New York was the village I served in) for there was the guarantee of plenty of candy to be collected. The first year I was there we did what every other house or business did. We set up a table and made sure we had plenty of candy. The following year, though, I wanted to do more. I wanted our church to have more of a presence. I wanted us in some way to reach all these children—there were indeed hundreds—with some word of hope, some message of the good news, some non-threatening and definitely not in your face message that God is good all the time and Christ’s love is there for all. There was a church down the block from us serving up hot dogs. That was their tradition. It was a good one for God does indeed feed not just the body but the soul as well. Then there was this trying-to-start-up-non-denominational church up the road who was against Halloween, but used this night in which hundreds of children descended upon the village to hand out religious tracts asking if they knew they were saved. With free hot dogs on one side of our church and religious tracts on the other, how could we be a light of Christ on All Hallows Eve? Light. Pumpkins. Ever since I was a little girl I have adored jack o’lanterns. I looked forward to the day my parents took us kids pumpkin picking. And when Halloween drew near, we would line the kitchen table with newspaper and have a family pumpkin-carving party, which would end with a mess in the kitchen and all of us standing in the crisp night air admiring our lit creations. What if we, the church, carved an inspirational message in the pumpkins, lined them up in front of our old historic building, right by the table in which we offered candy, and lit them up for all to see? Pumpkinfest for God was born! The first year we posted the inspirational message on the bulletin board, one letter on one piece of construction paper, and asked folks to take one letter and carve it into a medium to large pumpkin and bring it back with a candle in it before dusk on the night of the festivities. Strong winds, however, blew that night and candles were being snuffed out. Fretting over this failure only lasted a second as a farmer quickly came to the rescue and showed up with a drill in one hand and white Christmas lights in the other. Soon the Christmas lights were fed through the pumpkins and, thanks to a very long extension cord, the message illumined the darkening night. 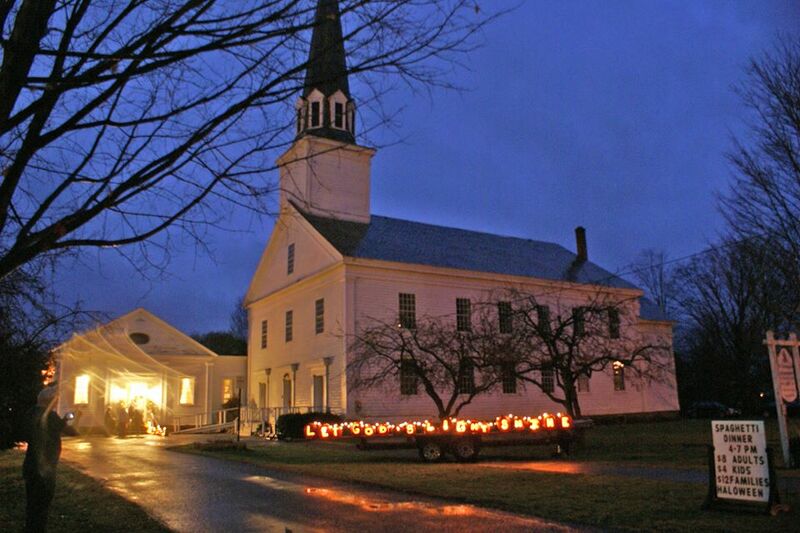 Soon Pumpkinfest for God became our church’s beloved tradition with every year a different message being lit up. One year, volunteers bought the pumpkins. Another year a local farm allowed us to glean the pumpkins from their fields. And yet another year, I stopped at this little boy’s home where the festive fall display had always caught my eye. It was the year I challenged the church to stop thinking in terms of what can we get free from the community. Instead, to start thinking how the church can help local business owners who daily faced the heroic struggle of doing business in an area in which it seemed almost impossible. So there I was ready to load up my car with 20 pumpkins and then some. Pumpkin by pumpkin I hoisted into the back of my Subaru, and as each was hoisted I lifted a prayer. I prayed for this little boy who grew these pumpkins year after year. I prayed for his family. I prayed for the youth group who was in charge of coming up with the inspirational message and the carving of the pumpkins that year. I prayed for the children who would be coming into our village. I prayed that in some way this message would indeed be the light for someone walking in darkness. I prayed for the little village I served asking God to bless it. Pumpkin by pumpkin a prayer was lifted. I was ready to go. There was a problem though. No one was home and pumpkin purchases were made on the honor system. A little boy’s chicken scratched note read, “Leave the money in the metal box. Thank you.” The metal box had no lock on it, no slit in which to place the money securely into it. Nothing. I stood there with a crisp $100 bill, way more than what the total came to for the prices of these pumpkins were the best around. I hesitated leaving the money, but I couldn’t wait around. I looked at my watch and knew that soon the little boy would be home from school. So I took the chance. In went the $100 bill among the ones and fives and quarters that were already there. I smiled as I wondered what this little boy’s reaction would be when he saw that much money in his metal box. It was then I prayed one more pumpkin prayer. It was a prayer of thanks that God had opened the hearts of our congregation to bless this little boy with such a generous gift of gratitude for the work he had done growing pumpkins. I thanked God for providing our church, which faced the same daily struggles as the businesses in the village faced, with means in which to do this wonderful act of generosity. I prayed a pumpkin prayer that day simply thanking God for the beauty of being connected to one another and the joy there is when we realize that connection and we help one another out. One, two, three…yep, seven years have gone by since Pumpkinfest for God started. The little boy isn’t little anymore, but he is still growing the best pumpkins around. I looked at my watch. He is still in school. I slowed the car down. Should I stop? I did. Pumpkin prayers were lifted once again. And a little boy who is not so little anymore had yet another surprise waiting for him in his now rusted metal box.